NEW YORK AUTO SHOW – March 23, 2016 – HARMAN International Industries, Incorporated (NYSE:HAR), the premier connected technologies company for automotive, consumer and enterprise markets, will join leading global automakers at the 2016 New York Auto Show to debut the latest vehicles featuring HARMAN’s connected car solutions and innovative branded audio technologies. HARMAN’s 5+1 layer security framework and connected services software portfolio, as well as the strongest roster of automotive audio brands including Harman Kardon, JBL, Infinity and others, reinforces the company’s position as a partner of choice for global automakers. 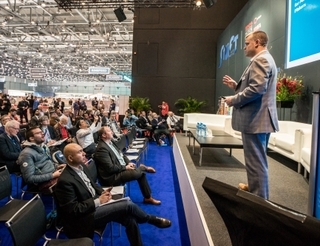 Following a successful showcase at the Geneva Motor Show and CES 2016, HARMAN has seen significant momentum for its revolutionary, smart in-car audio solutions including the system-on-a-chip based Summit Car Audio platform and portable, scalable Voyager Drive technology designed for entry-segment vehicles. At one of the premier industry gatherings of the year, HARMAN’s impressive showing across its automotive partners reinforces the company’s standing as the market leader for global car audio technology. Making its North American debut at the New York Auto Show, the Maserati Levante with HARMAN’s advanced compute platform touts a powerful and fast multi-touch screen and voice control system. Equipped with a high-resolution 8.4-inch SVGA screen, drivers will find navigating between the features of the infotainment system to be easy to use and built with purpose for a more productive driving experience. The system offers true plug-and-play features for limitless entertainment and is designed with a seamless human machine interface (HMI) experience across all user menus. The system is also built with in-vehicle add-ons including dual Bluetooth pairing and HARMAN’s Aha Connected Services to offer endless options for high definition quality Web-based GPS, radio support and more. Along with the new Porsche 911 Carrera and 718 Boxster, the new Porsche Macan will feature a 7” / 16:9 high resolution TFT touch screen and connect to WiFi-enabled devices like the iPhone via Apple CarPlay and other smartphones supporting hands free Bluetooth connectivity. The navigation system supports real-time traffic information, Google Earth, Google Street View, 3D city maps and landscape representation, plus automatic zoom for a clearer view of intersections, real-time traffic information and dynamic route guidance. Mercedes introduces its newest GLC Coupe and AMG GLC43 vehicles at the New York Auto Show, including updates to its COMMAND Online hub, featuring HARMAN’s advanced connectivity capabilities powering the most comprehensive infotainment solutions for today’s driver. The latest GLC family of vehicles include access to intuitive apps including Google Street View, Google Earth, local search, real-time traffic information, as well as the latest premium navigation technologies through 3D cities. The system is also built with the latest audio connectivity features for connecting to Wi-Fi enabled devices through the vehicle’s own wireless hotspot or via Bluetooth, making it even easier for drivers and passengers to seamlessly take their music on the road. The exclusive partnership between Lincoln and Revel continues with the introduction of the new highly anticipated Lincoln Navigator concept vehicle. Featuring HARMAN’s next-generation, multi-dimensional QuantumLogic surround sound technology and Clari-Fi™ music reconstruction technology. Revel’s deep scientific foundation, home theater speaker design heritage and trademark sonic signature are integrated into every Lincoln without a single compromise. Several new Toyota vehicles will be on display at the New York Auto Show including its latest Prius plug-in hybrid featuring JBL premium audio with GreenEdge™ technology, which delivers twice the performance with half the energy consumption of traditional audio components. Advanced components and innovative design means JBL GreenEdge audio components weigh less and take up less space in the car, with no compromises to volume or sound authenticity. HARMAN’s long-standing partnership with Hyundai expands as the automaker debuts its newest hybrid and electric vehicle, the Ioniq, featuring an available Infinity premium audio system offering HARMAN’s award-winning Clari-Fi music reconstruction technology. Redesigned for the first time since it launched in 2013, Kia will debut its all-new 2017 Cadenza full-size sedan featuring a premium audio system from Harman Kardon which includes Clari-Fi music reconstruction technology and next-generation QuantumLogic Surround Sound. In an extension of the partnership with HARMAN, this highly-anticipated new vehicle from Subaru features a custom-tuned Harman Kardon premium audio system.